With our still heavy snowload on the ground, I've taken to looking at the skies for birds and scrambling under trees where there are thinner patches of snow for signs of spring. Owl activity increases in January as they prepare to nest in February. We will hear both Barred and Great Horned Owls calling to one another in late winter and early spring. 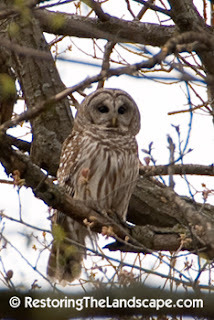 Returning home one evening in late January, a Barred Owl silently swooped through our yard and landed in the large white oak tree. We scurried into the house and watched him from there as he surveyed our yard for prey. I found potential evidence of his catch in the back yard this weekend, under our large white pine tree. There, the dark gray fur and bones of the rodent victim was neatly formed into a regurgitated owl pellet and lay on the snow. Owls don't chew their food but instead rip up portions of their prey with their beaks and swallow it whole. 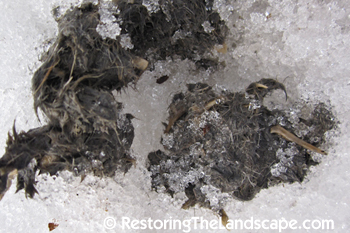 Their digestive systems sort the soft tissue from the indigestible bones and fur, the owl then later regurgitates these indigestible parts into a pellet. 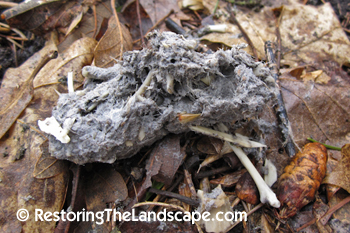 A good place to look for owl pellets is under evergreen trees. 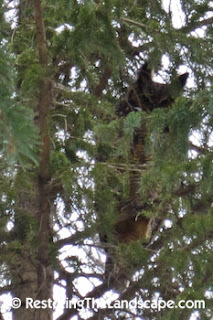 I often see owls resting in evergreen trees during the day. These trees provide more cover to help conceal them from harassing crows and bluejays. You can report owl sightings in Minnesota through the Minnesota Bird Breeding Atlas project. More information is on the Audubon Minnesota website.